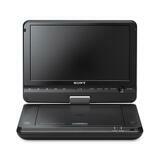 Portable DVD Player features a swivel 9" wide-screen display and high-resolution screen (800 x 480 resolution). 180-degree swivel, flip screen offers multiple viewing angle options. Battery lasts up to 6 hours. Included car adapter allows extended viewing during travel. Convenient touch-screen keys on bezel, a 180-degree swivel and flip screen make it easy to operate and watch your favorite movies. USB port allows you to enjoy pictures and music on the go. With disc-resume function, you can boot up a DVD to where you left off. Portable DVD Player offers Dolby Surround Down Mix; a remote control; CD, CD-R, CD-RW, DVD playback, MP3 Playback; screen saver; DVD+R DL, DVD+R, DVD+RW, DVD-R, DVD-RW, JPEG playback; and two headphone jacks. Player includes an AC adapter and runs on 2 AA (manganese) batteries. Sony's warranty requires the consumer to contact Sony directly with any issues about this product.